With a mitral regurgitation that is banging against the left atrium with every contraction day in and day out, over time - something's gotta give! 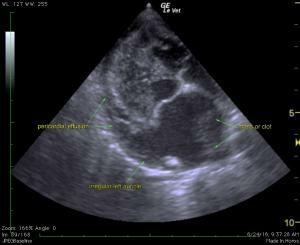 Pericardial effusion in light of severe valvular disease, think left atrial tear before tumor. Many thanks to Dr. Scott Martens from Hamburg Veterinary Clinic for providing the images for this case and kudos to technician, John Kollbocker on his excellent scanning. Join us at our next SDEP Echo Lab in Denver, CO October 13-15 to learn how to obtain images like these and get up-to-date on the pathology we are seeing in cardiology by Mandi Kleman, DVM, DACVIM! 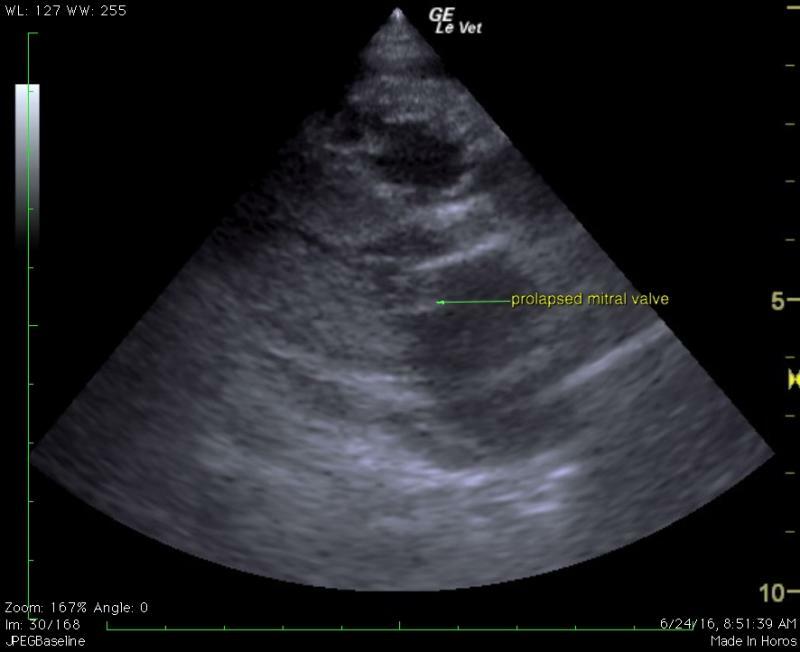 A 14-year-old, MN, 13.5 lb Maltese was presented for a possible syncopal episode after going upstairs and breathing heavier. The patient was treated with enalapril 2.5 mgs PO SID and scheduled for an echocardiogram. Physical Exam: Grade 4/5 murmur. Radiograph indciated severe cardiomegaly. BP 117/74 Map 90. CBC: Normal. Chemistry: Alk. Phos 1340. 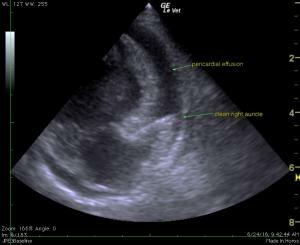 Pericardial effusion was noted in this patient. Mild to moderate volume overload of the left atrium and left ventricle was noted with a prolapsing mitral valve. Irregularity of the left atrium was noted which would suggest a tear of the left atrial wall. 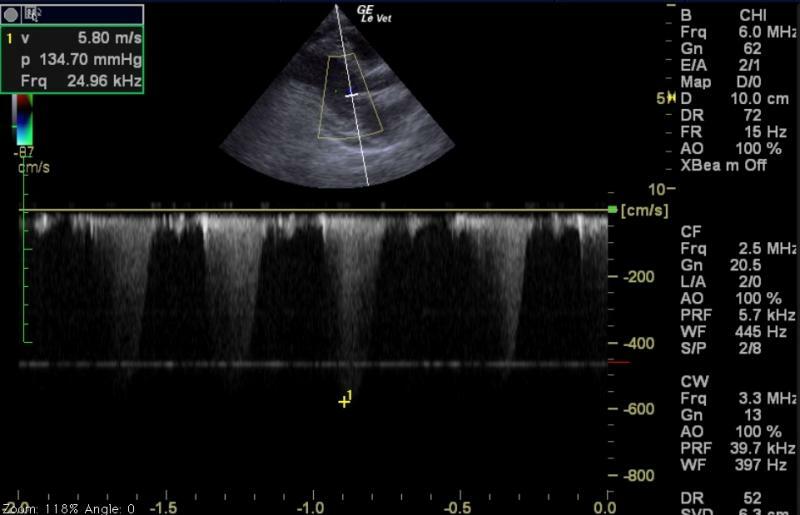 Prolapse of the mitral valve was noted with vegetative changes. 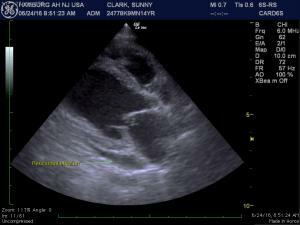 Pulmonary hypertension was present with the tricuspid insufficiency at 3.76 m/sec. Mitral insufficiency was noted at 5.8 m/sec. 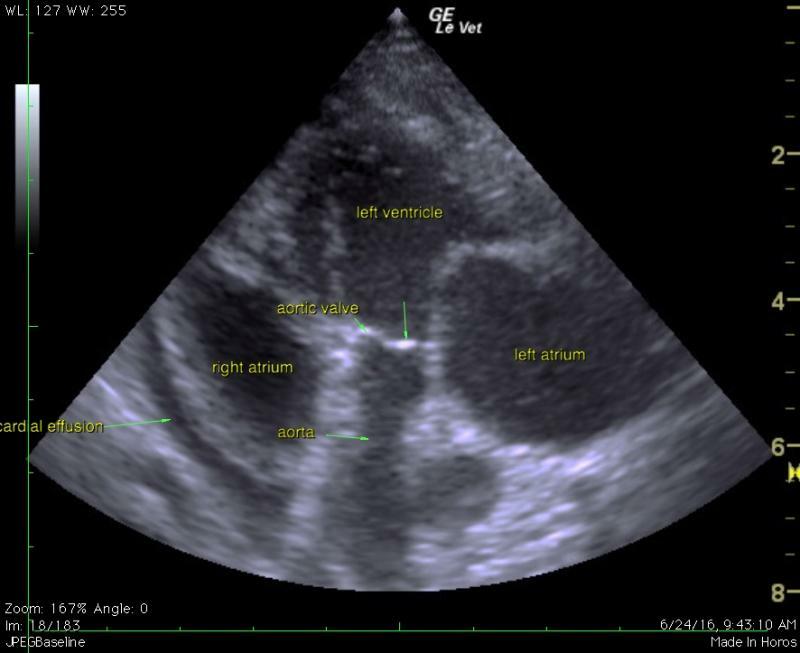 One particular view at the heart base in this patient revealed chronically enlarged and irregular left auricle with 2 cm echogenic structure at the base of the heart. This may be blood clot or possible mass. 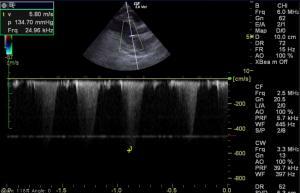 The echotexture would be most consistent with an attached blood clot. Mild hepatic vein dilation was noted in this patient. Vena cava measured approximately 1 cm at the diaphragmatic inlet. Following the echo, the patient was put on enalapril 2.5mg bid and furosemide 12.5 mg bid. She responded well with medications. Pimobendan would have been an additional choice but not implemented. Unfortunately, she developed kidney and liver disease. At that time the owners elected humane euthanasia. Survival tears can occur but usually have blood clots but not always. The actual tear is very difficult to find and was the case in this patient and extensive interrogation to find the tear in a stressed critical patient is not ideal as these patients are very very fragile. High resolution and the luck of the angle is usually necessary as the tear is usually small if the patient is still alive. The wall being thin also leads to echo drop out and tough to follow to begin with. In this case the mitral jet was directed to the roof of the left atrium in this patient so the atrial wall wears thin "like a hole in an old sock" as a cardiologist friend put it and the LA "roof" would have been the area to look for the tear here. The more and more we run into scenarios such as this we find that occasionally some quality of life can be managed with small tears. Differentials of pericardial effusion of course include neoplasia, pericarditis, CHF (in cats primarily as dogs don't typically have pericardial effusion in CHF but can occasionally happen and there is a minor chance that that is the case here but rare just the same). and idiopathic causes. 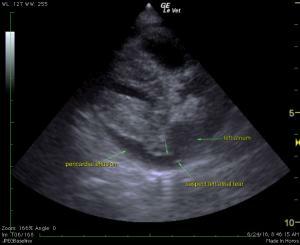 But the point of the discussion is that when pericardial effusion occurs in light of severe valvular disease in predisposed breeds its usually a "something has gotta give" scenario and occasionally we see them still alive with the probe. After discussing with cardiologists about this case in their experience, if a tear is recent there is usually a pericardial blood clot and when stabilized the clot can resolve, the hole can seal normalizing the pressure gradient and the patient can occasionally stabilize. Again, its rare but it happens. This may have been the case here. Unfortunately, post mortem was not available to confirm. Clean right auricle. 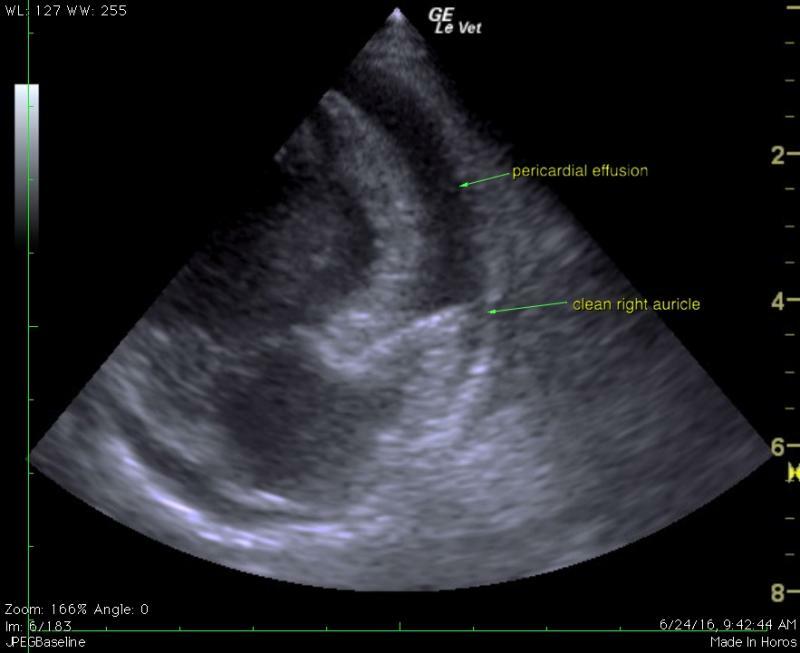 Pericardial effusion.